Visit Phoenix Books Burlington for a tarot reading. Rachel's approach to tarot draws from Jung and the concept that we can access collective symbols and archetypes from our unconscious that can assist in guiding our intuition. Join Kaela Coble to celebrate the launch of her first novel, Friends and Other Liars. Join Mark Bray for a discussion of his book Antifa: The Anti-Fascist Handbook. Join Mark Bushnell for a talk on his new book, Hidden History of Vermont. Join Martin Philip— the Head Bread Baker of King Arthur Flour—for a talk on Breaking Bread: A Baker's Journey Home in 75 Recipes. Celebrate Star Wars Reads Day, and master the art of reading! 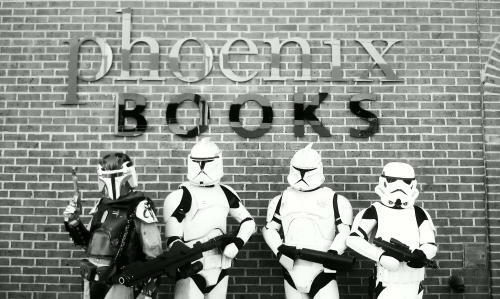 This will be Phoenix Books Burlington's sixth year celebrating Star Wars Reads.